Calling all investors!!! Fantastic 4 bedroom home in Marietta, Beautiful hardwood floors, Wood cabinets in kitchen, new AC unit and New Furnace. Enjoy hardwoods, and carpeting throughout. Private deck in back for grilling! Close to Shopping. 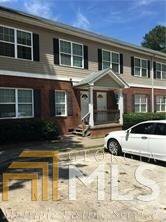 Minutes away from many of Atlanta's attractions, aquarium, New Braves Stadium - Sun Trust Park Close to Kennesaw State University Marietta Campus. HOA Fees include Water, Trash,Insurance and Landscaping.Complex has no rental restriction. Listing courtesy of Atlanta Communities. Selling Office: Non-Mls Company.